Unionization is like throwing sand in the gears of what is, by any measure, an institution that performs at an extraordinarily high level. THE Service Employees International Union has launched a campaign to unionize faculty members at the University of Washington. While we respect the role of organized labor in our nation and respect the faculty who are aligned with SEIU, we believe this effort is mistimed and misguided. Unionization right now would put at risk the excellence of the UW, diminishing the institution as a regional, national and international asset. Now is the wrong time and the UW is the wrong place for a unionized faculty. Our newly appointed university president, interim provost and many of our deans have been selected from our own UW faculty colleagues. From a faculty perspective we currently have an administration that is “us” not “them.” This group of leaders rose through the ranks as UW faculty members. As colleagues, they have proved themselves capable, effective, respected and trustworthy. They have a track record of respect for and participation in the long-standing tradition of the faculty and the administrative leaders sharing governance of the university. Now is a time for the faculty and administration to work together directly to make our university even better. It is thus the wrong time for the unionization of the faculty at the UW. It is interesting that there is no example in our country of a unionized tenure-track faculty among the top research-intensive universities, public or private. Faculty members at these types of universities, like the faculty at the UW, have a great deal of independence and have extremely wide-ranging activities — from 100 percent instruction to 100 percent research, from part-time to tenured, from biologist to pianist to heart surgeon. Paul B. Hopkins is the Leon C. Johnson Endowed Professor of Chemistry and former chair of the UW Department of Chemistry. Ed Lazowska is the Bill & Melinda Gates Chair in Computer Science & Engineering and former chair of the UW Department of Computer Science & Engineering. 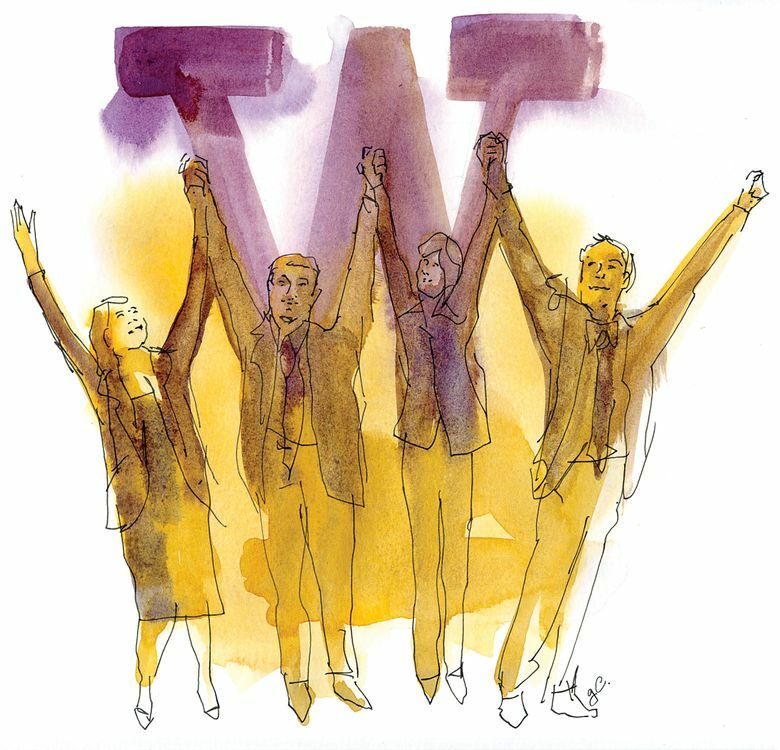 UW faculty members are often themselves administrators, supervising a number of other university employees. Perhaps this is why recent unionization campaigns at top public institutions, such as the University of Illinois and the University of Minnesota, have to date failed. It would add complexity, not advantage, for a faculty functioning under such diverse circumstances to be required to bargain collectively. As a leading research-intensive university, the UW is the wrong place for a faculty union. We understand why a subset of UW faculty members is campaigning for unionization. In recent decades, public institutions of higher education throughout the nation, including the UW, simultaneously faced rising enrollment demand from students and declining state investment. In response, they became increasingly reliant upon contingent faculty members. These so-called “freeway fliers” were modestly compensated and had weak job security. In some states, contingent faculty unionized. In Washington, state law does not allow contingent faculty to unionize separately from other UW faculty. But it is unnecessary to unionize the entire faculty of the UW to improve the circumstances of contingent faculty. We call on the two branches of UW shared governance, the Faculty Senate and the administration, to collaborate to improve the employment conditions of contingent faculty at the UW. The current chair of the Faculty Senate has already embraced this cause. Using the existing shared governance structure, not forming an overarching faculty union, is the best way to address the concerns of contingent faculty. The UW’s leading faculty members consider SEIU unionization at this point in time as an unwelcome change — a big step backward. They see multiyear, one-size-fits-all contracts not as progress, but as throwing sand in the gears of what is, by any measure, an institution that performs at an extraordinarily high level. Those faculty members believe that unionization would serve the excellence of the UW less well than the present system. They believe that unionization would hinder our ability to recruit and retain the next generation of outstanding faculty members and to serve our students. For these reasons, and more, many of them have voluntarily signed a statement of opposition to unionization at UW Excellence (uwexcellence.org). The University of Washington should distinguish itself as a national leader among research-intensive universities by improving working conditions for contingent faculty members, not by being the first among our peers to gamble with our success by unionizing our entire faculty.